With about 7000 living species, amphibians currently occupy almost all the habitats on Earth. 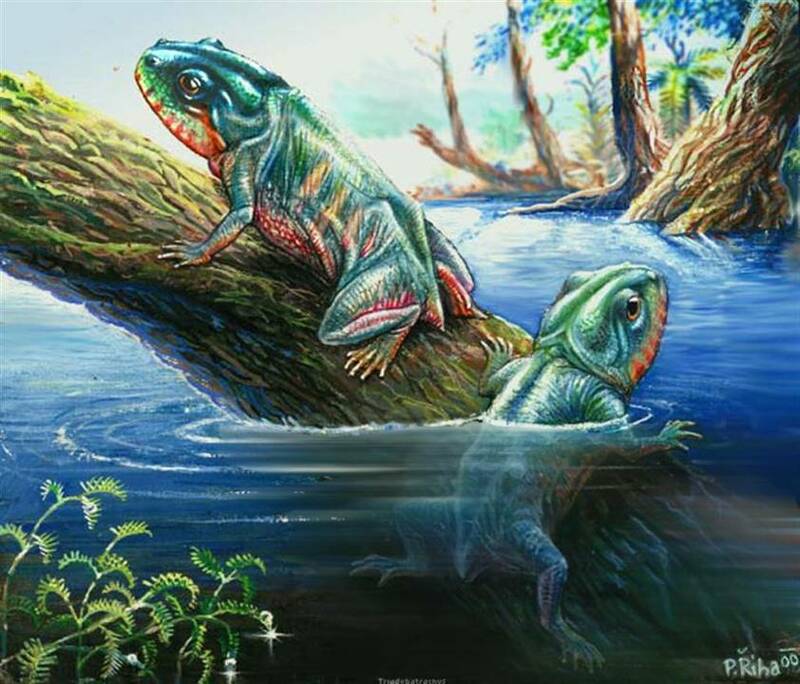 While in the last entry we explained the origin of the first tetrapods and how those gave rise to the different groups of primitive amphibians, in this entry we will explain in more detail the characteristics of current amphibians, the so-called lissamphibians. 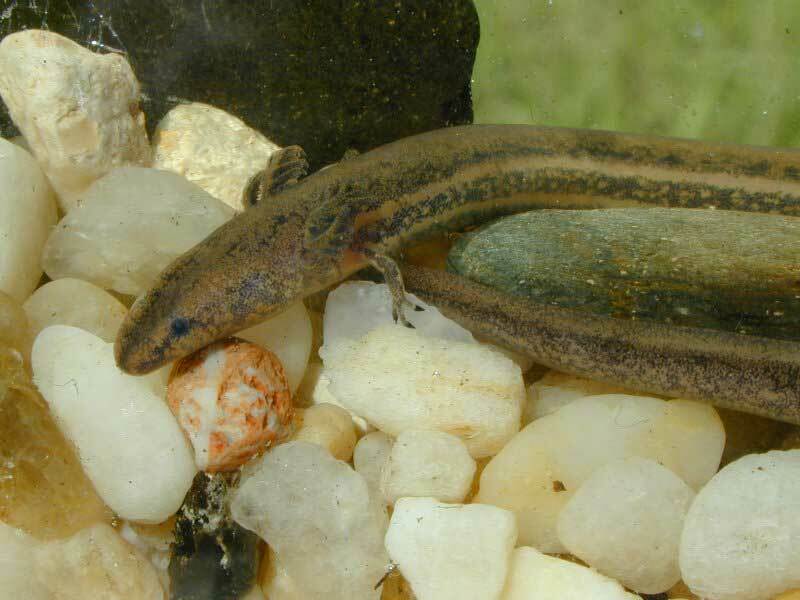 The term “Lissamphibia” (“smooth amphibian”) is used to name current amphibians and it’s useful to tell them apart from the rest of fossil amphibians, while the term Amphibia (“double life” referring to the aquatic larval stage of most species), is used to name all tetrapods except the amniotes (reptiles, birds and mammals). Smooth, scaleless, permeable skin that allows gas exchange (both pulmonary and cutaneous respiration) and the absorption of water (most amphibians usually do not need to drink water). This makes them susceptible to skin infections like the one from the Batrachocytrium dendrobatidis fungus. Section through frog skin by Jon Houseman. A: Mucous gland, B: Chromophore, C: Granular poison gland, D: Connective tissue, E: Stratum corneum, F: Transition zone, G: Epidermis, and H: Dermis. Two types of skin glands: mucous (the majority, to maintain humidity) and granular (less numerous, secrete toxins of different intensity). 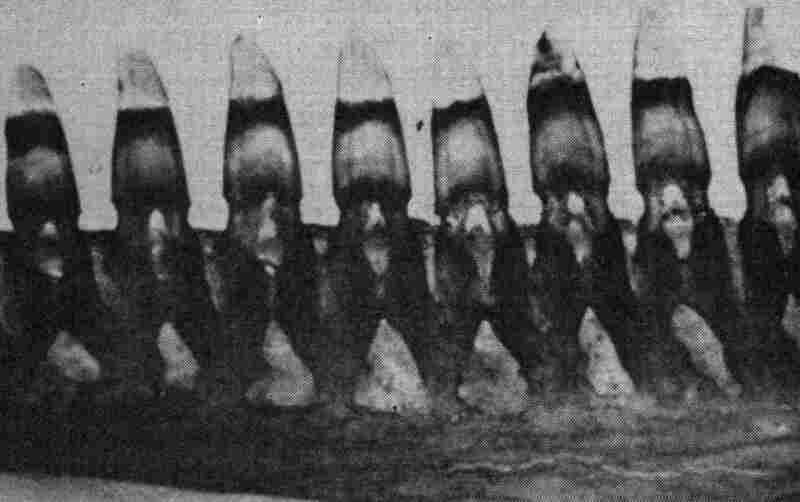 Photo of pedicellate teeth, in which the crown and base are made of dentine and are separated by a narrow layer of uncalcified dentine. A pair of occipital condyles. Short, stiff ribs not encircling the body. Four digits on the front limbs and five digits on the hind limbs. Skeleton of giant salamander in which we can see some of the characteristics of lissamphibians. Photo by Graham Smith. Papilla amphibiorum, a group of specialized cells in the inner ear which allow them to hear low frequency sounds. Stapes-operculum complex which are in contact with the auditory capsule, improve reception of aerial and seismic waves. Fat bodies associated with gonads. Presence of green rods in the visual cells (these allow the perception of more colours). Presence of a muscle elevator of the eye (called levator bulbi). Forced-pump ventilation system (their short ribs do not allow pulmonary ventilation, so they pump the air through their mouth). 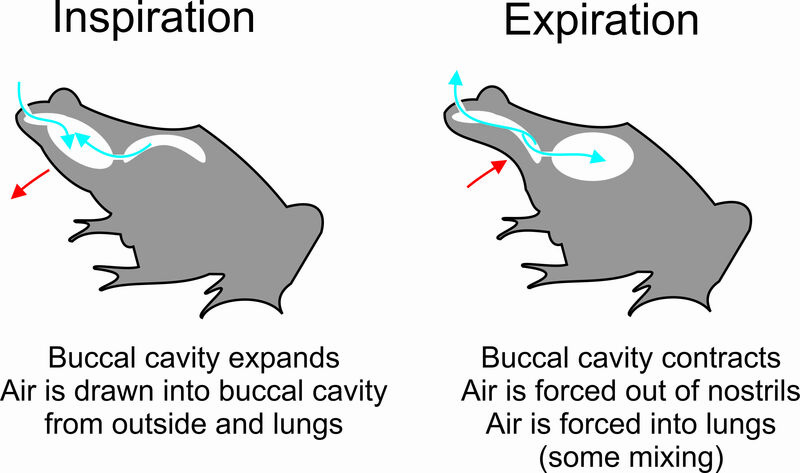 Explicative diagram about buccal ventilation in lissamphibians, by Mokele. Nowadays only three living amphibian orders persist: the order Salientia or Anura (which includes frogs and toads), the order Caudata or Urodela (salamanders and newts) and the order Gymnophiona or Apoda (caecilians). The second name of each order refers to the current species and their recent ancestors, while the first name refers to the whole order since the separation of each order. There are two hypotheses regarding the relationships between the three orders. The most accepted both by anatomic and molecular analyses is that Salientia and Caudata are grouped together into the clade Batrachia, while the other one is that Caudata and Gymnophiona together form the clade Procera. Two hypothetical evolutionary trees by Marcello Ruta & Michael I. Coates (2007), showing the Batrachia and Procera hypotheses on the relationships between Salientia (S), Caudata (C) and Gymnophiona (G). Currently there are three groups of hypotheses of the origin of lissamphibians: the temnospondyl hypotheses, the lepospondyl hypotheses and the polyphyletic hypotheses. Temnospondyls are the main candidates to be the ancestors of lissamphibians, as they share many characteristics, such as the presence of pedicellated, bicuspid teeth, and short, stiff ribs. 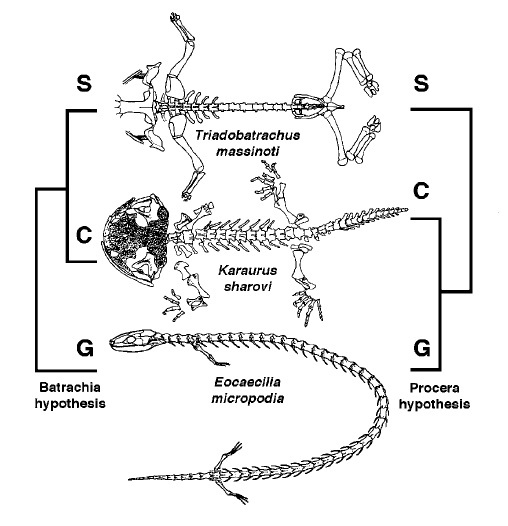 Authors defending these theories say that lissamphibians suffered during their evolution a process known as paedomorphosis (retention during the development of juvenile characteristics), this way explaining why temnospondyls reached such large sizes while lissamphibians are much smaller and usually have lighter and less ossified cranial structures. 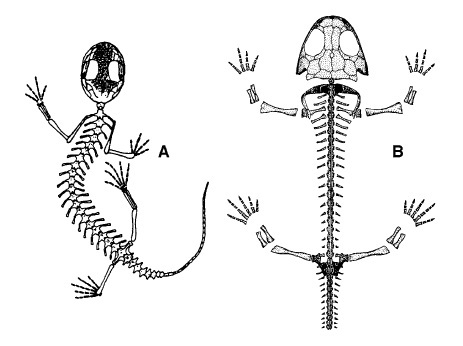 Drawings from Marcello Ruta & Michael I. Coates (2007) of skeletons belonging to Celteden ibericus (left, a lissamphibian) and Apateon pedestris (right, a temnospondyl) to show similitudes in skeletal structure. Hypotheses regarding a lepospondyl origin for lissamphibians do not have such a strong support as the temnospondyl hypotheses. However, recently some statistical studies combining anatomic and molecular data have given some support to these hypotheses. Nevertheless, there is a third group of hypotheses we must consider, the ones that say that lissamphibians are a polyphyletic group (with different origins for the different orders). According to one of these theories, frogs and salamanders (clade Batrachia) would have a temnospondyl origin, while caecilians (order Gymnophiona or Apoda) would have originated from lepospondyl ancestors, many of which had already suffered a limb reduction process. Modified outline of the three different hypotheses regarding the origins of the lissamphibians; 1. Lepospondyl origin, 2. Temnospondyl origin, 3. Polyphyletic origin. Still, most authors support a monophyletic and temnospondyl origin for lissamphibians, but alternative hypotheses shouldn’t be discarded. With up to 4750 species, frogs and toads form the most diverse lissamphibian order. The first known Salientia is Triadobatrachus, which, despite having a tail, already presented some typical characteristics of modern frogs, such as a short spine with few vertebras and the hind limbs longer than the front limbs. Interpretation by Pavel Riha, of the ancient Salientia, Triadobatrachus massinoti. A short and stiff trunk (less than 12 vertebras), an especially long pelvic girdle and the vertebras of their posterior end (that in other amphibians form the tail) are reduced and fused forming the urostyle. Long hind limbs, with the tibia and fibula fused together (to aid in impulse during jumping) and short and strong front limbs (to resist the impact on the landing). 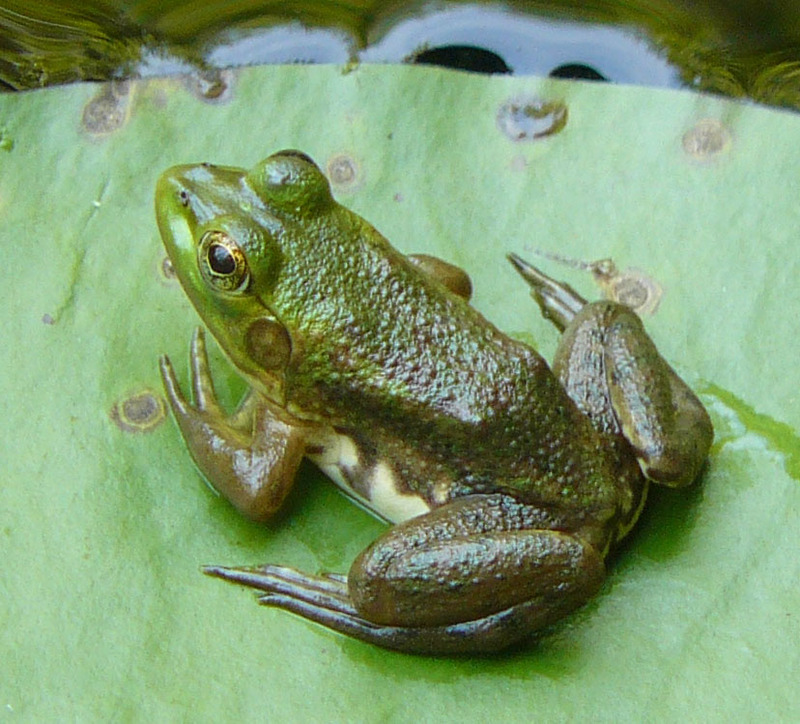 Photo of a pig frog (Rana grylio), a typical american anuran. Also, of all current amphibians frogs are the ones with the most developed hearing apparatus and vocal organ. Males, usually present specialized structures to amplify sound during the mating season. 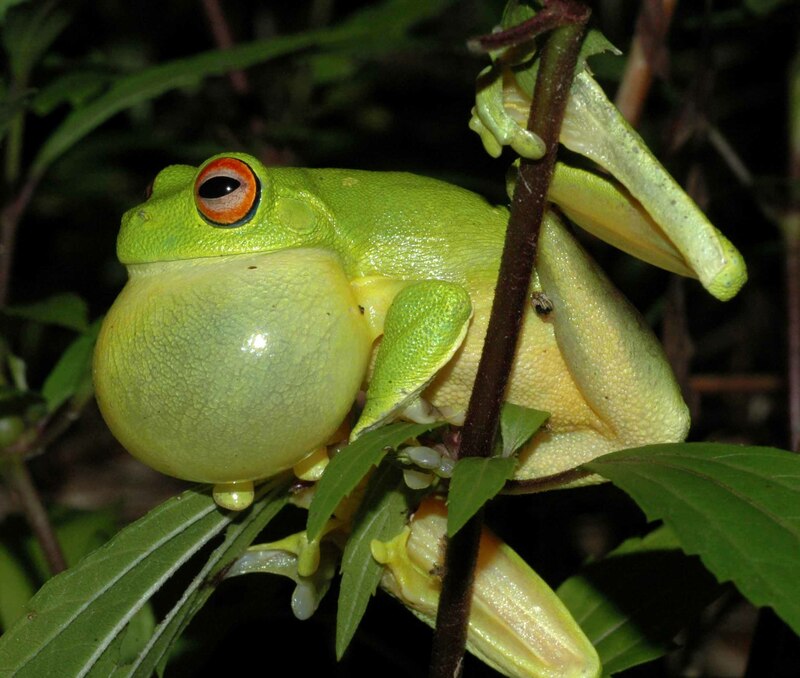 Red eyed tree frog (Litoria chloris) showing the vocal sac, used to amplify the sound of its calls. Size in anurans varies from 3 kg in weight and 35 centimetres in length of the goliath frog (Conraua goliath) to the 7, 7 millimeters long recently discovered Paedophryne amanuensis, currently the smallest known vertebrate. 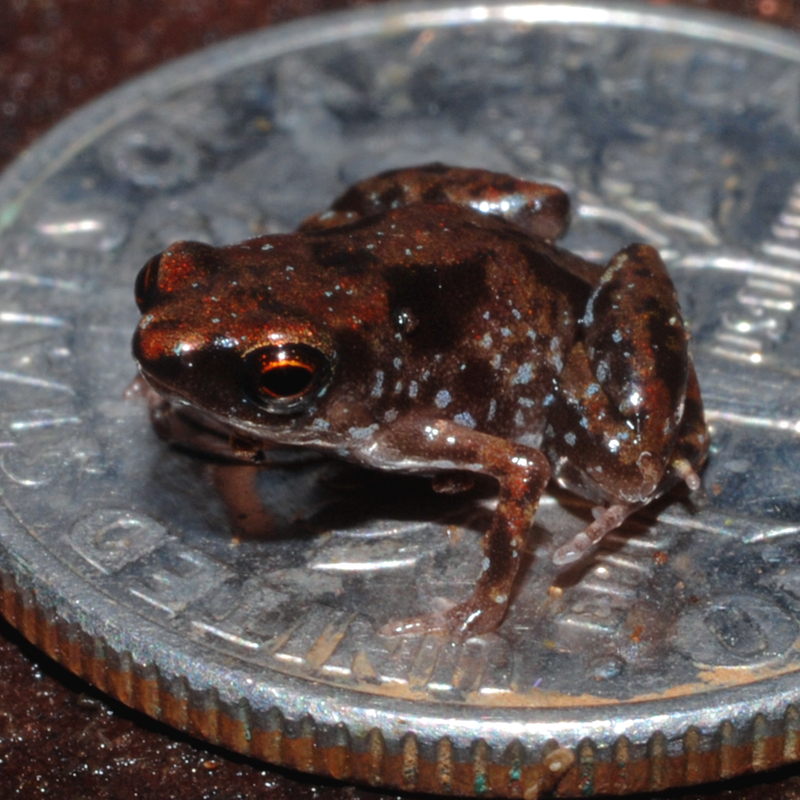 Photo from Rittmeyer EN, Allison A, Gründler MC, Thompson DK, Austin CC (2012)  of Paedophryne amanuensis, the smallest known vertebrate in the world on a US dime. 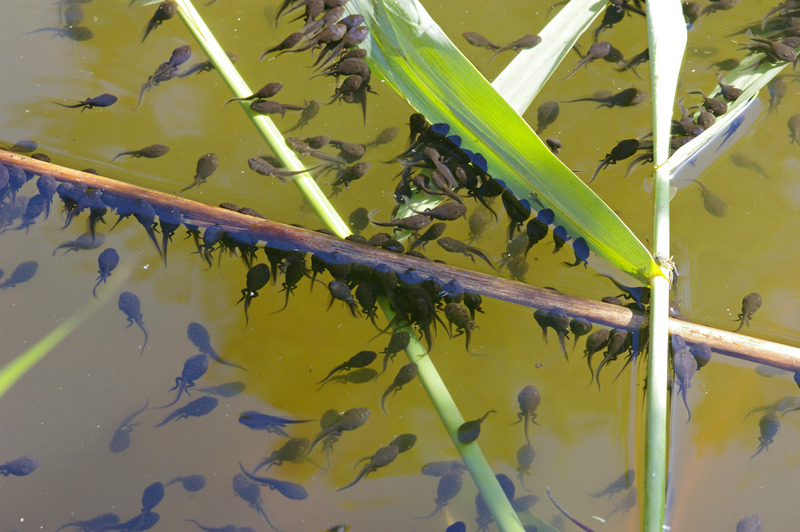 With such a diversity, vital strategies of anurans vary greatly and it’s difficult to generalize on their reproductive biology, even though most show indirect development (born as tadpoles and passing through a metamorphosis process) and they mate and lay their eggs in an aquatic medium. Tadpoles of common toad (Bufo bufo) from northern Germany by Christian Fischer. The urodeles or caudates are the order of lissamphibians which externally most resemble primitive amphibians. This group includes salamanders and newts, most of which have a long body, a well-developed tail and four relatively short legs. Most urodeles are terrestrial and are distributed mainly in the northern hemisphere, with a few species inhabiting the tropics. 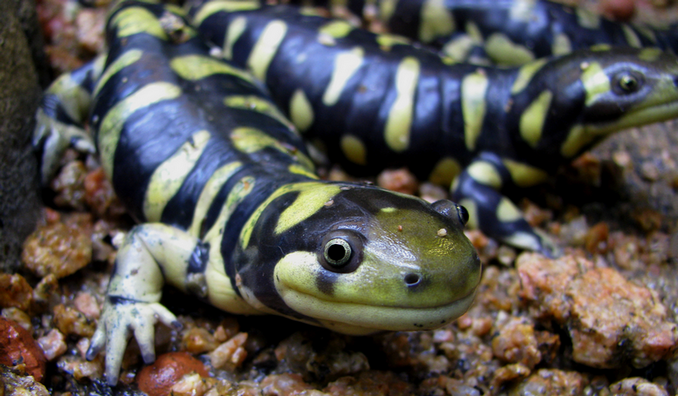 Photo of an eastern tiger salamander (Ambystoma tigrinum) from the House of Sciences, Corunna - Spain. Taken by Carla Isabel Ribeiro. Most species present internal fertilization and are oviparous. Most also present indirect development (larvae, metamorphosis, adult), and the larvae usually resemble miniaturized adults with external, ramified gills. 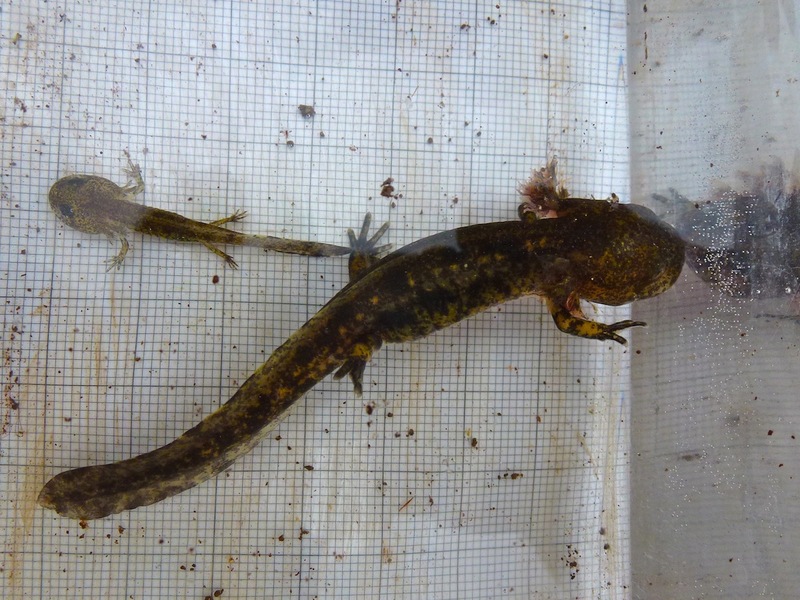 Various groups of salamanders suffer neoteny phenomenon, in which individuals, even though sexually developing into adults, externally keep larval characteristics. Young and very large larvae of near eastern fire salamander (Salamandra infraimmaculata), Ein Kamon, Israel. Photo by Ab-Schetui. Currently, urodeles are classified into three suborders: the Sirenoidea, the Cryptobranchoidea and the Salamandroidea. Sirenoideans are urodeles with both specialized and primitive characteristics, such as the loss of hind limbs and the presence of external gills. Cryptobranchoideans are large primitive salamanders (up to 160 centimetres) which present external fertilization, while salamandroideans are the most numerous group of urodeles (with more than 500 species) and the most diverse, with most species being terrestrial and having internal fertilization using packs of sperm called spermatophores. Photo of a northern dwarf siren (Pseudobranchus striatus) a sirenoidean from the United States. The most ancient known member of the order Gymnophiona is Eocaecilia micropodia, an amphibian about 15 centimetres long with a considerably long body, a short tail and really small limbs. 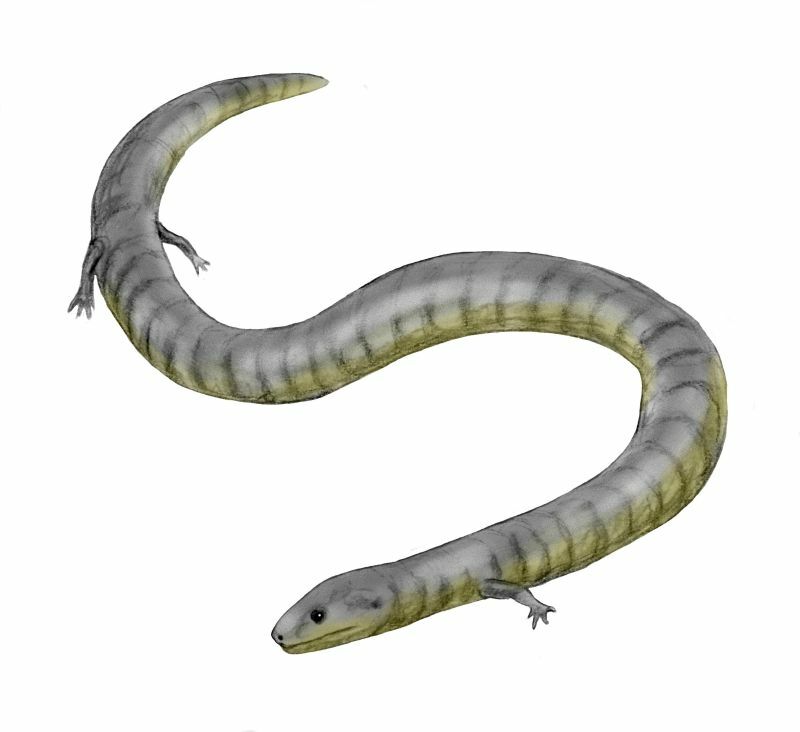 Restoration by Nobu Tamura of Eocaecilia micropodia an ancient Gymnophiona from the early Jurassic. 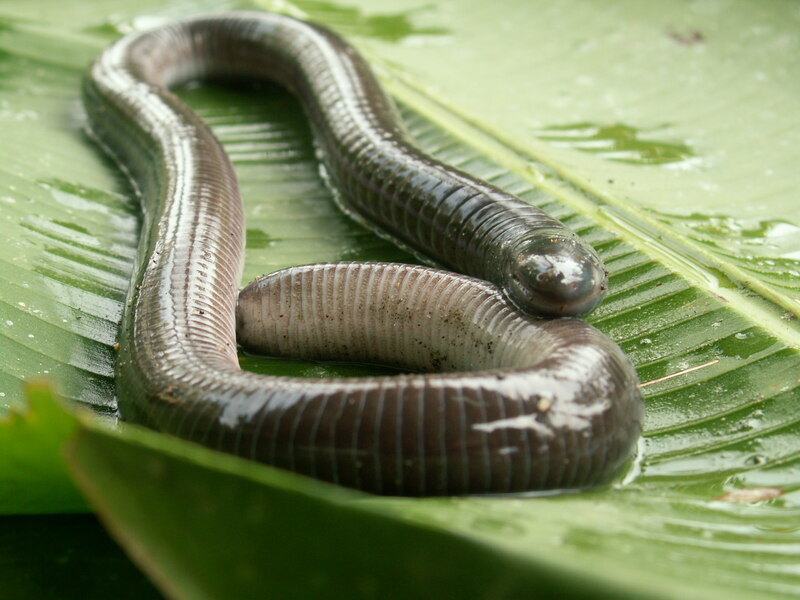 Current caecilians (order Apoda) have completely lost any trace of limbs, girdles or tail, due to their adaptation to a subterranean lifestyle. That’s why they also suffered a process of cranial hardening and their eyes are extremely reduced. They also present a series of segmentary rings all along their bodies, which make them look somewhat like earthworms. Yellow-striped caecilian (Ichthyophis kohtaoensis) from Thailand, by Kerry Matz. 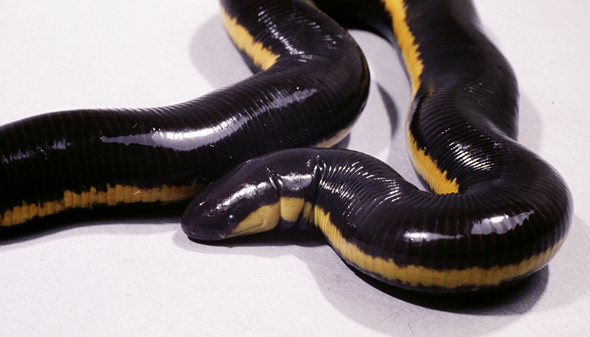 There are currently about 200 species of caecilians divided into 10 families. Their size varies from about 7 centimetres in the species Idiocranium russelli from Cameroon, to up to 1,5 meters of Caecilia thompsoni from Colombia. They present a pantropical distribution, internal fertilization and a great variation in their development (there are viviparous and oviparous species and some which endure metamorphosis while some have direct development). Photo of Gymnopis multiplicata an american caecilian. Photo by Teague O'Mara.